CommandWear Systems Inc | In the News: CommandWear helps save lives while keeping first responders safe. 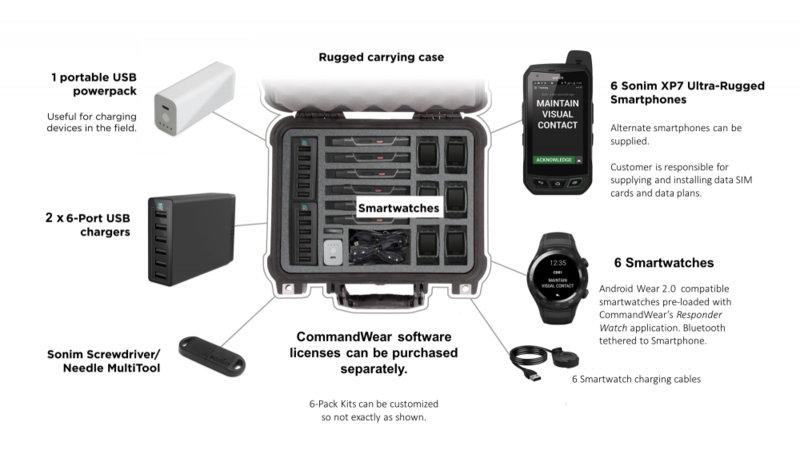 CommandWear offers Pilot Programs including a deployable pilot kit to allow agencies to test the apps on ultra rugged smartphones from Sonim and new smartwatches. Request your trial kit here. CommandWear Systems Inc. is working to address a global problem – poor situational awareness and communication among first responders in emergency situations. Launched in 2013, the Vancouver-based company develops software and mobile apps for wearable technology to keep first responders safer on the job. Founder and CEO Mike Morrow is a public safety technology veteran. After spending years working with first responder teams, he witnessed many lives negatively impacted by the lack of tools available to help responders and survivors in crisis situations. Incident reports from events like 911, hurricane Katrina, riots and mass shootings show that better situational awareness tools among responders could increase the number of lives saved. In most cases, agencies struggle to maintain accurate communication with field operatives. A post-911 report outlined the consequences of failed communication tools, “…clear warnings were transmitted to responders 21 minutes before the building fell, yet most firefighters never heard those warnings or earlier orders to get out. Cut off from critical information, at least 121 firefighters, most in striking distance of safety, died when the north tower fell,” an analysis by The New York Times has found. In the US alone, 57,180 police officers were victims of assaults while on duty, and over 300 officers have been killed since 2016. Firefighter casualties also have risen from 15% from 2012 to 2015. Sources conclude that improved situational awareness and biometric monitoring would improve officer safety and reduce these numbers. POLICE DURING THE 2011 VANCOUVER RIOT. Many emergency response teams rely on radios or in-vehicle technology to communicate, but this presents a problem: responders must either have their hands free to use a radio or be in a vehicle to navigate and report critical information. CommandWear’s platform solves this problem by leveraging smart wearable and mobile technology to improve situational awareness. Their proprietary software runs on smartphones, smartwatches, tablets, laptops and desktop PC’s to gather data and improve communication between first responder teams. “Responders need to track their teams, know where they are at any moment in time, communicate effectively and be able to go back and review what happened to update their plans,” says CommandWear’s Founder and CEO, Mike Morrow. The platform collects information on responders’ location, heart rate and status, enabling the team to remain hands-free while fully connected. Responders can also send photos and videos to share situational information or use a panic button on the smartwatch to trigger an alert to the command centre. Alerts are automatically sent based on biometric readings from smartwatch sensors. COMMANDWEAR PLATFORM WITH SMART WEARABLES. CommandWear got its start at Wavefront. Morrow enrolled in the Venture Acceleration Program, which helps early-stage companies launch and grow their mobile and IoT technology business. “The Venture Acceleration Program helped us determine an effective go-to-market strategy and provided solid mentorship to guide the process,” says Morrow. CommandWear also received investment funding from IRAP for research and development along with several introductions to potential partners and investors through Wavefront. The company often works out of Wavefront’s Vancouver coworking space. “Wavefront provided valuable connections for us to find the right talent for our team and helped start conversations with future partners and clients. We’re grateful for the mentorship and advice that’s helped us implement a successful market strategy to date and we got great value from the affordable office space,” says Morrow. CommandWear has conducted over twenty operational field deployments of its wearable technology with various public safety and security organizations around the world. The technology is also being used by corporate and private security companies in North America, working to make urban workplaces safer. “We are proud to be doing our part to equip first responders with the right tools and intelligence to help them keep our communities safe and keep themselves alive,” says Morrow. In addition to police services, CommandWear has worked with emergency health services such as the BC Ambulance Service providing smart wearables to paramedic bike squads. This technology has helped paramedics respond to the Opioid crisis in BC. PARAMEDIC EQUIPPED WITH SITUATIONAL AWARENESS TOOLS. The company has also garnered a number of awards for their innovative technology. In 2016 they were one of seven companies around the globe who received the World Information Technology and Services Alliance’s biennial award for an innovative digital solution and among the winners voted most likely to have a positive impact on society. In addition, the US Department of Homeland Security chose CommandWear along with nine other companies to participate in their First Responder Innovation program EMERGE, designed to bring together startups and strategic partners for research and development. CommandWear recently partnered with a large international police force. Together they will launch new wearable technology solutions designed to enhance officer safety and operational efficiencies. See article. The company plans to continue expansion into international markets including the US, looking for further opportunities to pilot the life-saving technology with public safety and security organizations. Increasing security threats around the globe are also beginning to drive interest from commercial and industrial organizations. Are you a growing tech company with a mobile and IoT solution? Need help with your go-to-market strategy or finding international partners? Sign up for one of Wavefront’s programs today! Whether you’re just starting out, in high-growth and looking to scale or want to expand overseas, we have the expertise and training to support your growth. Wavefront companies experience 4-5 months accelerated time to market when compared to the national average. Check out our early stage accelerator program, growth stage accelerator program, and global accelerator program, accepting applications year round!